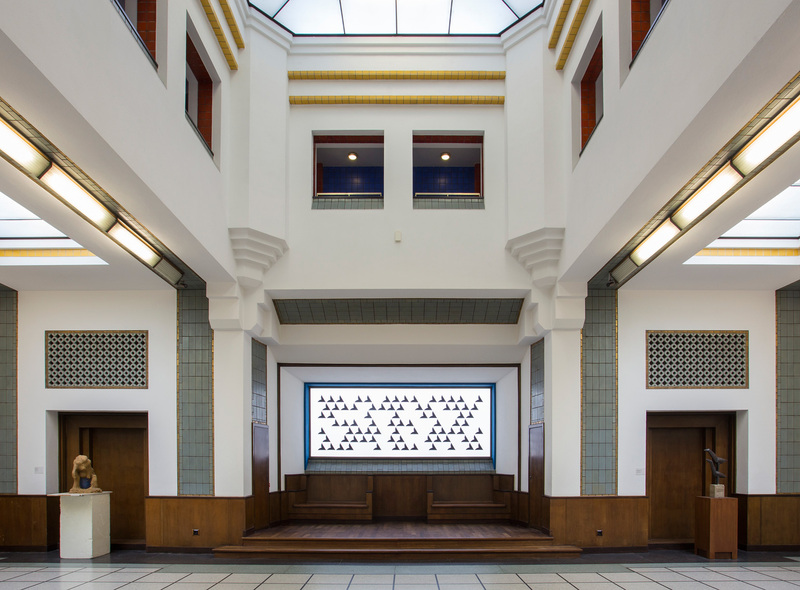 Bridget Riley, op-art exponent and all round 1960s icon, has designed a new installation to adorn a first-floor window in The Hague’s Gemeentemuseum. Entitled Dance, a semi-transparent painting drawing upon Riley’s important, early black and white works. Inspiration was initially sparked by her 1962 painting Tremor, which hangs in Gemeentemuseum’s permanent collection. Upon visiting the museum in 2012, Riley, who hadn’t laid eyes on the artwork since its creation, became transfixed by it, which compelled her to retrace her monochrome steps for a series of new pieces, of which Dance is one. The work’s position in front of the window is inspired. ‘The daylight behind the window lends it an extra dimension,’ Riley explains. The sunlight’s strength and position in the sky alters the brilliance of the white background, and the opacity of the black detailing, engaging with Riley’s lifelong interest in the harmony between form and colour. These preoccupations, of course, also belonged to the master of Dutch abstraction, Piet Mondrian. Many of his masterpieces line the walls of adjacent galleries in Gemeentemuseum, which is considered to be the Netherland’s ‘home of the arts’. The building was constructed in 1935 by storied Dutch architect HP Berlage. Over the years, its original neo-Romanesque design has been embellished by renowned artists – Sol LeWitt, Niele Toroni and Gunther Forg to name a few. These murals and paintings have transformed the fabric of the building into a patchwork of artistic achievement, and a monument to abstract art’s development. According to museum director Benno Tempel, Riley’s new painting is ‘a dream come true’, and it’s easy to understand why. Dance extends the museum’s long tradition of encouraging world-class artists to use its blueprints as a canvas, turning the building itself into Gemeentemuseum’s largest permanent exhibition.